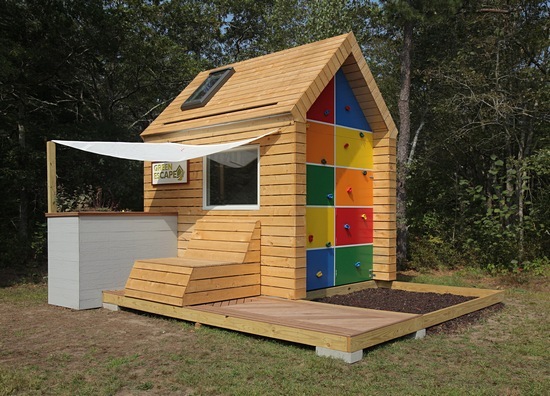 A family in Cape Cod recently won this amazing Green esCAPE playhouse in a raffle benefiting local charities. While we applaud their success and generosity, it's hard not to be just a little bit jealous of their kids who will get to enjoy the grand prize. Designed by the talented employees of Zero Energy Design, Cape Associates, and Shepley Wood Products, this playhouse provides a true retreat for kids, encouraging them to play outside and stay in touch with nature. Although it may be designed for the little ones, the unique features of this one-of-a-kind clubhouse might be too much for mom and dad to resist. 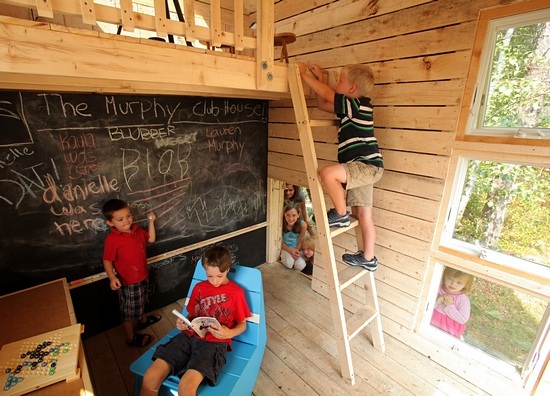 The Green esCAPE playhouse features rough-sawn spruce boards, which are naturally weather resistant. Rainwater is captured through integral roof gutters to be deposited in a catchment barrel. The attached succulent and herb garden can then be watered using the rainbarrel spigot. Talk about learning while you play! An outdoor chaise for one or two provides a spot to relax, and is movable to follow the sun. A reclaimed sail has been repurposed to provide shade for the large south facing window in the summer. When opened, windows on both sides capture passing breezes and allow for passive cooling. Storage cubbies offer easy access spaces for toys and games, while a chalkboard encourages drawing and writing. Crank lights and a crank radio use kid power to operate. The blue racer rocker, made of recycled milk bottles, offers fun yet durable seating. In the corner, a kid-height sliding side door guarantees an easy second exit at all times. And that’s only the bottom floor! Climb the ladder to the second floor loft area and you’ll be treated to twin skylights that flood the playhouse with sunlight during the day and provide the perfect platform for stargazing at night. Love this house. What are the dimensions and where can I buy it? The Green esCAPE features rough-sawn spruce boards, which are naturally weather resistant. Rainwater is captured through integral roof gutters to be deposited in a catchment barrel. The attached succulent and herb garden can then be watered using the rainbarrel spigot. A reclaimed sail has been repurposed to provide shade for the large south facing window in the summer. When opened, windows on both sides capture passing breezes and allow for passive cooling. An outdoor chaise for one or two provides a spot to relax, and is movable to follow the sun. Climb the ladder to the second floor loft area and you'll be treated to twin skylights that flood the playhouse with sunlight during the day and provide the perfect platform for stargazing at night.